The article, Visibility in the cloud, provides a general discussion of how to monitor cloud infrastructure. This article uses the Amazon Elastic Compute Cloud (EC2) service to provide a concrete example of implementing sFlow monitoring in a public cloud. In this case two Amazon Linux 64 bit instances have been created. In order to provide sFlow monitoring, open source Host sFlow agents were installed on each server. 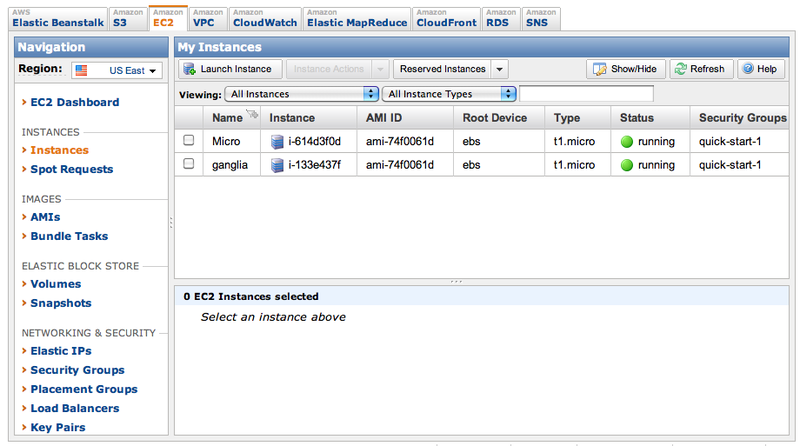 Note: Amazon does include basic performance monitoring through its CloudWatch service. However, there is a charge for minute granularity reporting and alerts. Implementing a monitoring solution based on the sFlow standard is free and provides minute granularity reporting. In addition, implementing a standards based approach to performance monitoring provides a solution that is portable between public cloud providers (see Rackspace cloudservers for examples of sFlow monitoring in the Rackspace cloud) and private clouds.